Frank Taylor and his team have had a 35 year relationship with the people and landscape of the Kokoda Trail, the Western Front, Borneo, Kokoda Beach Head, the Thai-Burma railway system and Myanmar. Frank himself has travelled over the Track over 140 times, coupled with numerous shorter explorations of specific areas and localities of historical importance. We offer a complete approach to Australian Military Heritage Tours in sharing the full travel experience and campaign history with accurate information content and wide geographical knowledge in our programming. TOURS PROGRAMMED FOR 2019 – BOOK NOW! 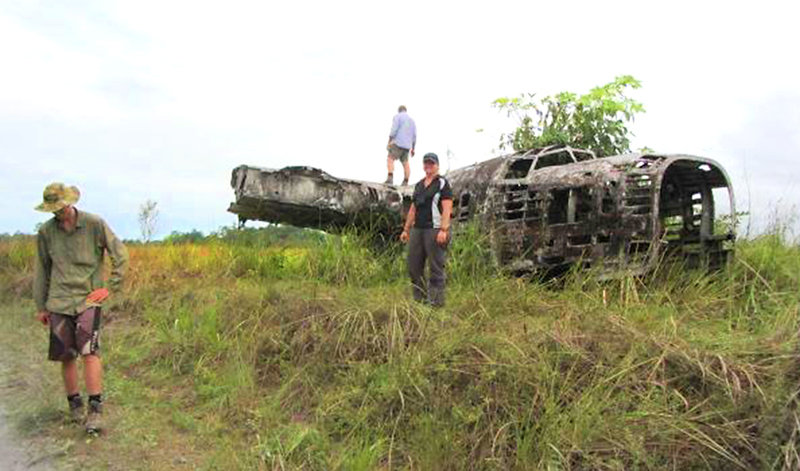 MILNE BAY BATTLE (OPTIONAL): Monday 5 August to Wednesday 7 August 3 DAYS, 2 NIGHTS: A non trekking 4WD tour and guided study of the Battle of Milne Bay – a little appreciated and visited turning point of the war in the SW Pacific. $985 share twin. THAI-BURMA RAILWAY (Thailand Sector) Tuesday 30 April to Tuesday 7 May 8 DAYS, 7 NIGHTS: Thailand sector of the Thai Burma Railway factual historical tour ‘right to the border” of the full length of the Thai sector of the Thai Burma Railway with some original route exploration. $2,770 share twin. Check with us for details of our factual historical tour to the Myanmar/Burma sector of the Burma sector of the Thai Burma Railway through much “just opening to visitors” areas. $2,755 share twin. 7 DAYS, 6 NIGHTS: Burma Road, Mandalay, Irrawaddy River, Bagan etc exploring sites of war time significance and cultural locations and settings, both iconic and off the tourist trail. Price to be confirmed. For all tours : Single Supplement cost available. Land only unless stated otherwise. We have an extensive folio of experience in planning and operations worldwide to sites and places of significance to Australians and our military history. Please consult with us for assistance and advice on visiting destinations and locations of interest not shown on the list above. FRANK TAYLOR and his team have had a 35 year relationship with the people and landscape of the Kokoda Trail, the Western Front, Borneo, Kokoda Beach Head, the Thai-Burma Railway and Myanmar. Frank himself has travelled over the Track over 140 times. He has been the on-location liaison for several separate historical documentary film shoots of the Track, including for the Australian Army (‘The Bloody Track’) and the ABC’s Four Corners Team (‘The Men Who Saved Australia’) and the ABC’s 2 part documentary ‘Kokoda’ plus ‘Requiem for a Generation of Lost Souls’ – Japanese pilgrimages by relatives of war dead. Additionally he has been acknowledged for guiding and advising several leading Australian military history authors over The Track, including Peter Brune, Paul Ham and Peter Williams. He has been an invited guest speaker at the University of Liverpool UK on his work in locating Borneo PW Camps and his tours there and numerous presentations to historical and service organisations. Over 35 years experience in tour operations and planning in remote areas, including Papua New Guinea, Borneo, Thailand, Burma, Egypt, Libya.